TT RGB PLUS Ecosystem is the intelligent lighting system for PCs that combines the most advanced addressable LED lighting with Thermaltake’s patented TT RGB PLUS Software. TT RGB PLUS ecosystem provides nearly unlimited possibilities for playing with colours, synchronizing lights to games, music, CPU temperatures or other TT RGB PLUS products, including case fans, CPU/VGA waterblocks, AIO CPU coolers, PSUs, LED strips, gaming keyboards, headsets, mice and mouse pad. The patented software allows users to change the light modes, colours, speeds, brightness, fan speeds, and even supports AI voice control in iOS and Android devices. Talking to TT RGB PLUS App is an easier, faster way to set lights for your systems. You can ask it to turn the lights on or off, switch lights modes, dim the lights, change light colours, or adjust lights speeds or fan speeds. Thermaltake Riing Plus 12 Fan TT Premium Edition. 120mm high-static pressure fans with a patented 16.8 million colours LED ring and 12 addressable LEDs, the Riing Plus 12 RGB features compression blades and hydraulic bearing, and can be controlled by the patented TT RGB PLUS Software and AI interactive voice control. 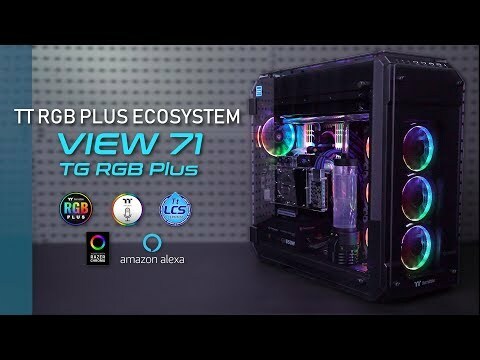 All Thermaltake TT RGB PLUS products support Amazon Alexa Voice Service, allowing you to control the lights or fan speeds by talking to the Alexa-enabled device. With the support of Amazon Alexa, TT RGB PLUS products also offer an additional visual cue for checking current weather condition in your location or anywhere in the world. All you have to do is simply starting the sentence with “Alexa, tell Thermaltake”, then the lighting colour will correspond to the weather condition in the location. Strip your case down to the bones and install elements when and as you need them with our modular design. The View 71 TG RGB Plus features modular panels, racks, brackets, and pre-design mounting arrays. No more unreachable screw corners or gaps, installation can be a breeze with our Dismantlable Modular Design. Features • Supports E-ATX, ATX, MicroATX and Mini ITX Motherboards. • Tempered glass front, top and side panels. • Front, rear, top, bottom and side support for radiators. • TT RGB Plus App support. • CPU Cooler up to 190mm. • GPU length up to 410mm (310mm with HDD rack). • PSU length up to 220mm (without bottom fan).